An introduction to relative unknown luxury watch brands for budgets of any size. A watch tells more then just time, it tells a story behind the man who wares it and the history of the watch itself. For many watch enthusiasts, there is a strong sentimental attachment to a particular watch brand. It could be for its style, personality, values and they way which the watch represents the man. Whatever your reason is, let me open your horizon to 7 luxury watch brands you may not know exist. These brands show merit of sophistication and top class, which is why I have chosen them as the brands you, must know about. Rossini watches opened its official flag stores in Tmall and OKBUY, in January 2013. Their watches bring you supreme fashion and a sense of quality, authenticity and exclusivity. Their choice and range fits with all budgets and styles. So if you haven’t checked out Rossini watches be sure to. 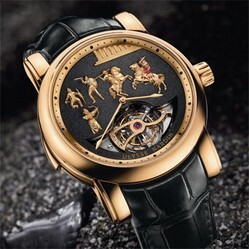 Founded in 1846 by Swiss watchmaker, Ulysse Nardin. The brand is over 165 years old and has become widely respected for its highly accurate marine chronometers. After new management the brands started to produce pioneering timepieces by utilising innovative materials and manufacturing techniques. To date, the brand has attained 18 international gold medal and 4,300 first prizes in chronometrics. Blancpain was founded in 1735 by Jehan-Jacques Blancpain in Villet Switzerland but now is owned by the Swatch Group. The brand places emphasis on quality verses quantity, which means they produce fewer than 30 watches per day with each timepiece carefully crafted by a single watchmaker. The brand is renown for its “super quality” in wristwatches today. Girard Perregaux has origins dated all the way back to 1971, the inventor himself is considered one of the top 10 watch manufacturing companies in the world. Designing and producing their own movements, they are known for their timeless and classic designs. Different to many other high-end watch brands like Rolex, Girard Perregaux produces just 12,000 pieces a year. The brand Jaeger-LeCoultre has crafted some of the finest watches ever made. They have been a major player in watchmaking history since 1833. Over the years they have crafted some of the finest watches ever made, such as the Reverso, the Duoplan, the Master Control, the Memovox Polaris, the Gyrotourbillon and the Atmos. Sea-Gull watches was founded in 1955 by the Tianjin Sea-Gull Watch Group Co. they are renown as China’s largest and oldest watchmaker as they have over 55 years in watch making traditions and experiences. Sea-Gull specialises in designing and producing a range of mid-class and high end mechanical watches and movements. Their watches have simple and sophisticated features with outstanding craftsmanship and innovation. This is why it is China’s most respected and popular watch brands. FIYTA is an international watch brand that was created in 1987. Its company is currently based in Shenzhen in Southern China. The brand specializes in high-quality watch designs and manufacturing. It devotes its time to combining flawless craftsmanship with the latest horological technology to produce ever-more sophisticated timepieces. Check out the amazing FIYTA watch range here. Some of these watches have designs that border on steampunk. Nice page! Ha ha, no harm in looking, no, it's the stopping to buy that's the problem! Oh, I really shouldn't have read this, but so glad I did! Thank you!